I think that is hyperbole rather than a carefully researched statistic. But if he can make a go of his ferry to Bowen Island, then maybe he has a chance. Not surprisingly, another one he tried between Toronto and St Catherine’s failed. Being stuck at Duke Point for several hours in the pouring rain – my most recent experience on this run – gives me some reason to wish him luck – but I was in a car, so a passenger only high speed ferry would not have done me any good then. And the lack of transit services in the mid Island would also make me think twice about using it. 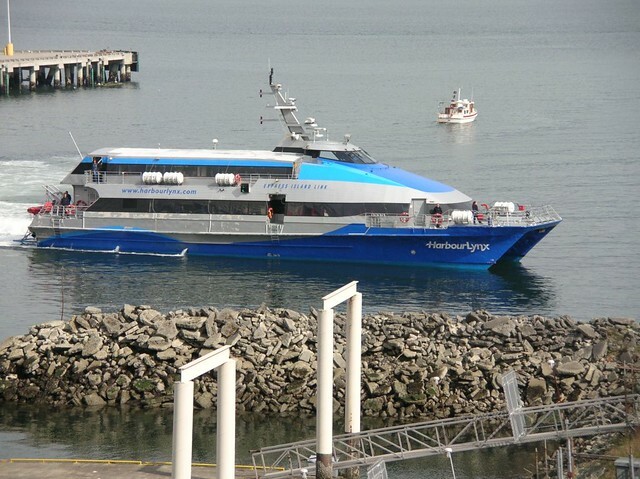 But as one wag remarked at the time of the Glen Clark fast ferry fiasco “Who wants to get to Nanaimo sooner?” AND Gabriola-based musician Bob Bossin once composed a ditty entitled “It’s So Nice Not to Be in Nanaimo” – anyone have an mp3 of that? This fellow must want to donate money to the public – Harbourlynx offered a Vancouver-Nanaimo passenger service from the Seabus terminal to Nanaimo (not sure where), and they went belly up. That was just over two years ago. A lot of people complain about BC Ferries, but on the whole they do a good job hauling cars and people to and from the island. I agree that lack of transit is a huge deterrence for people to visit Nanaimo (or the island north of that) on foot, however. I used it and its early 90s predecessor the Royal Sealink Express a few times; they did a fairly descent business (especially during the strike of ’03), but did not have enough funds to repair the engine when it broke down. As a downtown resident without a car it drives me nuts that I have to get out to car-ferry docks to get service to any islands… the water is a 10 min walk from my door! I’ll welcome any downtown foot-passenger ferry service! Hi, it is difficult to understand that a ferry service from DOWNTOWN Nanaimo to DOWNTOWN Vancouver is not viable. Ending up in Tsawassan or Horshoe Bay entails a long trip to get to downtown. With so much concern about the environment one would think that leaving the car home and be a foot passenger on an efficient link downtown/downtown would be a serious option. Once downtown Vancouver there are so many public transportation options (Supported by all B.C. taxpayers!! )that arriving there is distincly better than at the BC Ferry terminals.